Is the Criminalisation of Racism in British Football a Hollow Victory? The recently-concluded 2014 football World Cup in Brazil has been hailed as a success in terms of entertainment but the game faces increasing scrutiny in terms of allegations of racism and corruption. Here in the UK, the national press have recently reported on incidents of racism committed by spectators, such as fans blacking upwhen their team face an African opponent. Problems of crime and disorder have often been associated with football, primarily in terms of the apparently challenging and unacceptable behaviour of fans. However, just as criminologists often argue that crimes committed by the powerful tend to be overlooked relative to crimes committed by the powerless so too it seems that crimes committed by fans have been the focus, rather than those carried out by those in the boardroom. Are efforts to kick racism out of football failing when it comes to discrimination committed higher up within the institutional structure? This argument is explored in a new essay I co-wrote with Jon Garland from the University of Surrey. During our research we explored two decades of anti-racism in British football and examined the emergence of grassroots campaigns to tackle racism in the game. The chapter notes that the agenda and initiatives developed in the early 1990s including the Newcastle-based education campaign Show Racism the Red Card have come a long way. Peripheral groups and marginal issues of concern have come to form a major agenda in football in the 21st Century. 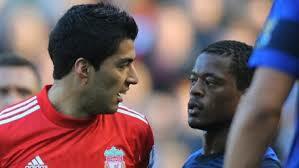 The FA sponsors an annual Respect campaign designed to highlight the fact that racism is not acceptable in the game. Despite being cleared in Westminster Magistrates Court, an FA hearing upheld that John Terry had used racist abuse against Anton Ferdinand and fined him £220,000 in 2012. In the aftermath of that ruling, the England manager resigned and was briefly replaced by Stuart Pearce. A sign of how much the anti-racism agenda has developed might be that, in contrast to the Terry affair, no comment was made regarding Pearce’s appointment in relation to the admission he made in his 2001 autobiography that he had racially abused Paul Ince when they had been opponents. There have also been major developments in terms of the criminalisation of racism within stadia. Legislation and ground regulations prohibit racist abuse. While these are under-enforced (as are all laws), stewards and police do intervene and fans are prosecuted and banned. Although around half of football supporters have witnessed racist abuse inside grounds, according to a recent survey, this was a decline from a survey in the 1990s which found that 67 per cent had witnessed such abuse. All of these developments are welcome but they represent something of a hollow victory since they have been driven primarily by a commercial imperative to rebrand the game. Sponsors, spectators and subscribers to satellite TV would be deterred from investing in a game tarnished by hooliganism and racism. It might be argued that the motive matters less than the outcome and that efforts to tackle racism are welcomed regardless. However, the ant-racist agenda needs to be developed to tackle the profound institutional dimensions of the problem. There continue to be hardly any black managers and few players of South Asian descent. Only a very small proportion of administrators within the British game are of a minority ethnic background. Anti-racism in football has come a long way in the last two decades but until the structural problems of the game are addressed these victories ring hollow. Mike Rowe is a professor of criminology at Northumbria University, UK. Garland, J. and Rowe, M. (2014) The Hollow Victory of Anti-Racism in English Football, in Hopkins, M. and Treadwell, J. (Eds) Football Hooliganism, Fan Behaviour and Crime: Contemporary Issues, London: Palgrave, pp.92-105.